Search for all "14-3-3 protein sigma / SFN"
Rabbit anti Bovine, Chicken, Human, Mouse, Rabbit, Rat, Sheep 14-3-3 protein sigma / SFN. SFN antibody was raised against synthetic peptide corresponding to acetylated N-terminal sequence of sheep 14-3-3 sigma. 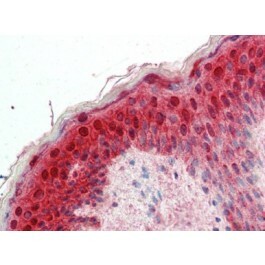 Immunohistochemistry on Paraffin Sections: 1/250. It is a member of the 14-3-3 family which consists of 30 kD proteins that are involved in multiple protein kinase signalling pathways, regulation of cell cycle progression, cytoskeletal structure, transcription, intracellular trafficking and targeting. Protein interactions with 14-3-3 show distinct preference for its different isotypes and are regulated by phosphorylation of both 14-3-3 and the bound protein. 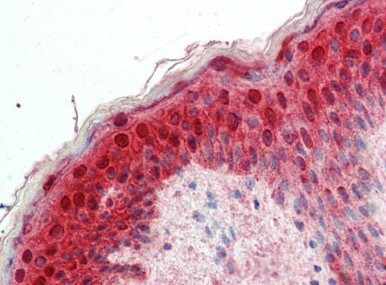 14-3-3 sigma is expressed mostly in epithelial cells and has been associated with cancers including breast, nasopharyngeal, endometrial adenocarcinoma, prostate, epithelial ovarian, colorectal, adenoid cystic, and papillary. 14-3-3 sigma binds c-fos activating the MAPK pathway. Sequestration of Bax by 14-3-3 sigma inhibits apoptosis whereas sequestration of 14-3-3 sigma by CARP-1 induces it. Mitosis is regulated by 14-3-3 sigma through binding keratin filaments and sequestering cyclin B1 and cdc2. p73-dependent induction of 14-3-3 sigma regulates chemo sensitivity in breast cancers with p53 mutations. In reaction to DNA damage and along with RACK1, 14-3-3 sigma targets, DeltaNp63alpha for proteasome degradation. 14-3-3 also negatively regulates both the glucocorticoid receptor and the activity of PKB/Akt which stabilizes p27 Kip1. Human, Mouse, Rat, Rabbit, Bovine and Chicken. This antibody reacts to 14-3-3 Protein Sigma (SFN) in all mammals. May not react with recombinant proteins that are not N-acetylated.